In Ubuntu 12.04 LTS, you can explore new upcoming apps or undiscovered cool apps – easily using Ubuntu Software Center. Now, some proprietary cool games are also available, besides the huge collection of free softwares. Here are some cool – collection of some most useful apps – that you must try in Ubuntu 12.04 or equivalent distributions such as kubuntu, Linux Mint etc. Top 10 Apps for Ubuntu 12.04 users! Nitro is a cool app for managing your tasks, your todo list – in an easy way. Synapse is a graphical launcher (more accurately – a semantic file launcher), also very useful in searching stuffs. If you’re looking for an equivalent of Unity HUD (e.g while using Cinnamon or XFCE on Ubuntu) then you must try it. Miro is a music player – that can play videos from the web, you can also download it if you want. Enjoy watching videos from the popular sites like YouTube, Hulu, Amazon Mp3 store as well as the podcasts and video feeds. Additionally, it can also do some video format conversion works for you. Shutter is a full featured screenshot application. 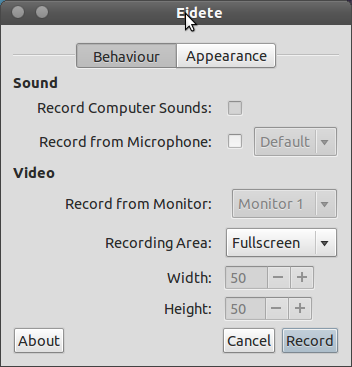 You can easily capture screenshot of a window or a specified rectangular area – with or without a delay. 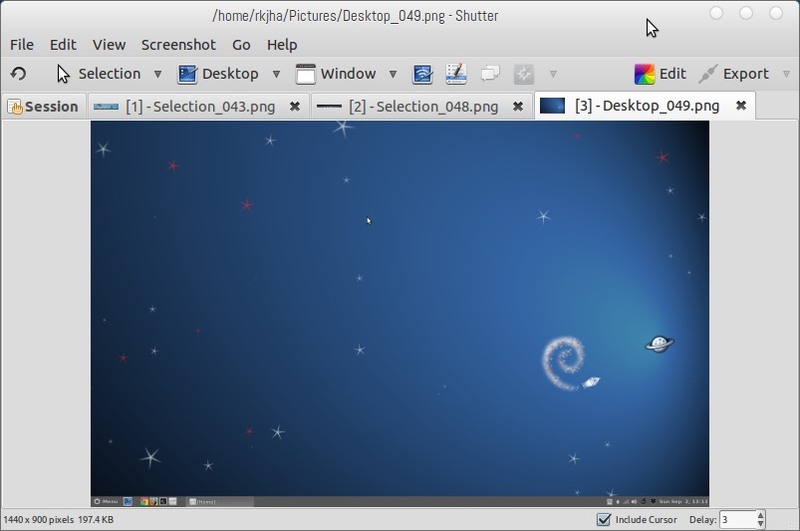 You can also edit your screenshot using the embedded drawing tool, apply cool effects, and upload/export images automatically to the configured ftp host or Ubuntu One. Eidite is a Screencasting application, it’s designed for simplicity and it works! 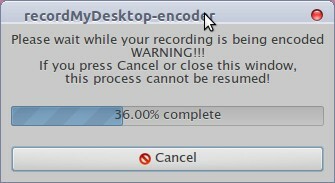 You must checkout if you’re not happy with the other screen recording application such as recordMyDesktop or Kazam. Steadyflow is a simple download manager, with an easy to use GUI and great features. Zim is a wiki application. It has some nice features (sync, links, formatting, images etc) with a nice UI. it’s really good for wiki style notes. The sync features keeps your notes updated (if you use it on multiple computer, using Ubuntu One or Dropbox) and safe. 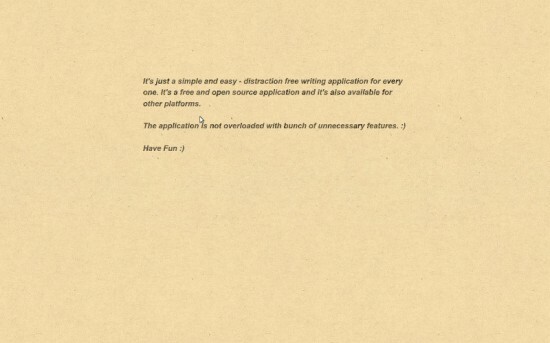 Catlooking is a distraction free writing app for those who love writing and looking for a text editor with minimal features. Download Catlooking and install it using a gdebi package installer (in Linux Mint) or Ubuntu Software Center (in Ubuntu). 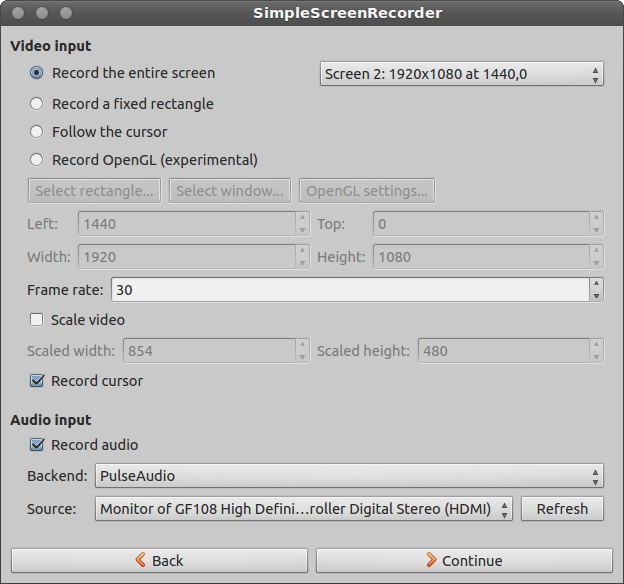 Handbrake is a video transcoder application, available for all platforms. It has lot of cool features and it supports variety of formats, so it can convert your video files for any devices you want. 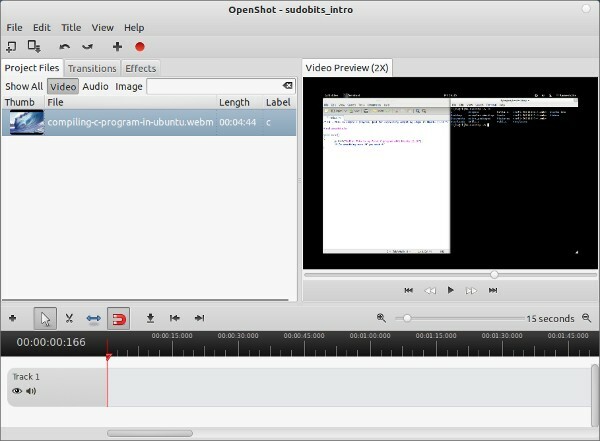 OpenShot is a simple and easy to use video editor, like a good substitute for the windows movie maker. it has nice features and it’s really good for beginners. Ubuntu has now become the most popular GNU/Linux distribution among the desktop users and developers, so now a days you can find almost any application for any kind of task, most of them are free softwares but some are commercial too. At the time of writing this post – I’m using Ubuntu 11.10 (which is the latest sable release) – so the applications has been tested on 11.10; Ubuntu 12.04 LTS will be out, in next few months, I’ve tried alpha versions and I’m sure these applications would also work well on 12.04 (and earlier versions such as 11.04/10.04 …) or other similar GNU/Linux distro such as Linux Mint, Debian, etc. So I’ve made a top 10 list of some cool Applications that is worth trying! 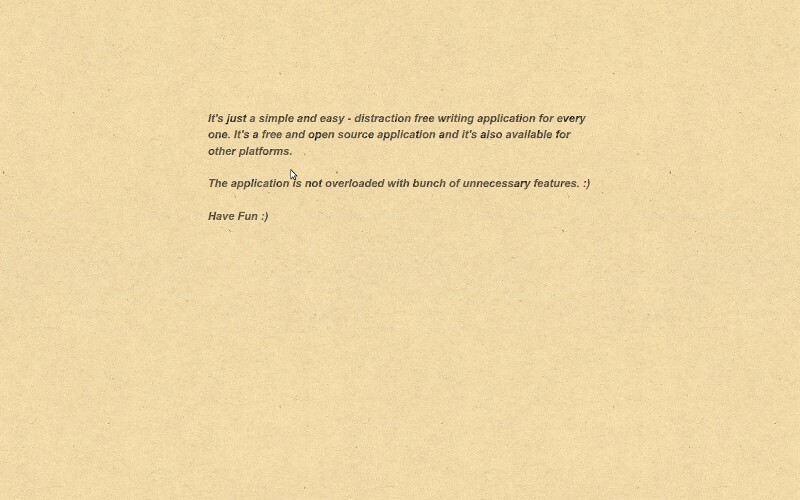 Zim is a cross-platform desktop wiki application that just works. 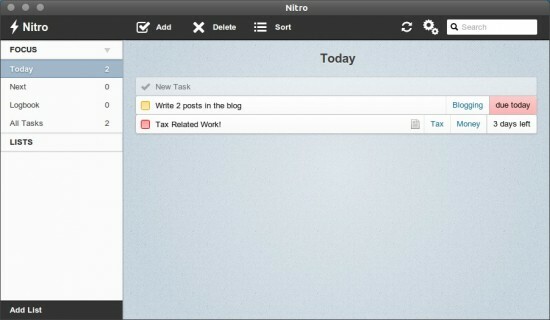 it is well suitable for taking/organizing notes, TODO list, brainstorming thoughts or innovative ideas. 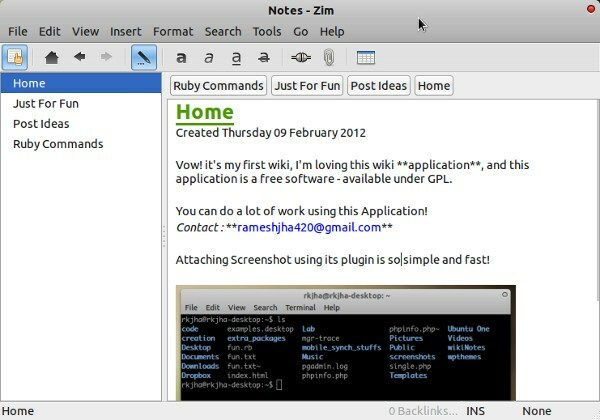 You might have used a notes management application such as Evernote or OneNote (which is quite popular) but the simplicity of Zim will make you a fan of it. The notes are stored on the desktop in a plain text format and it’s saved automatically. You can even create new page just by linking to non-existing page. Most of the above plugins are really cool! 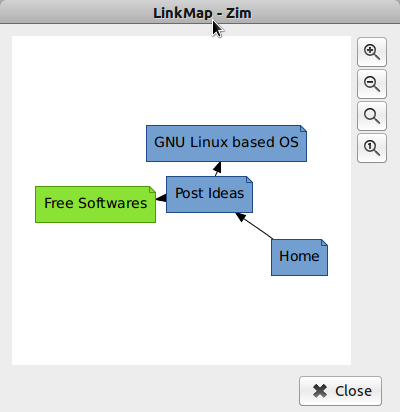 Here is a snapshot of Link Map view (first enable the plugin and go to View -> Link Map View) – representing the structure of my notes. Other users can get it from official download page. 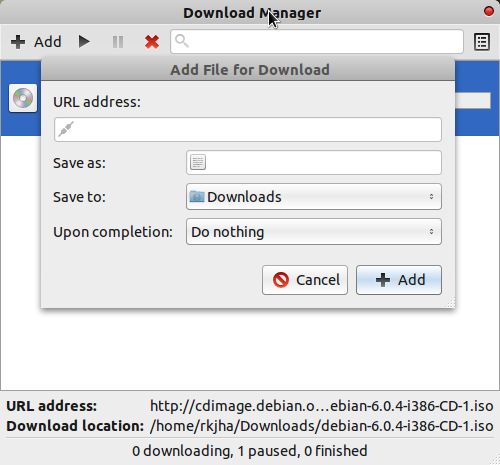 Steadyflow a simple and easy to use Download Manager based on GTK+. 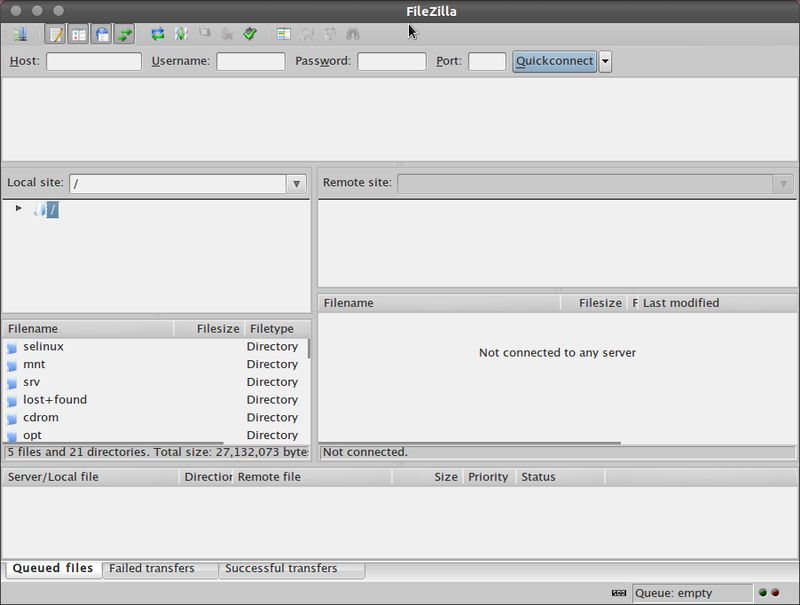 The GUI tends to follow minimal approach, in order to encourage simplicity, it’s pretty clean and straightforward. 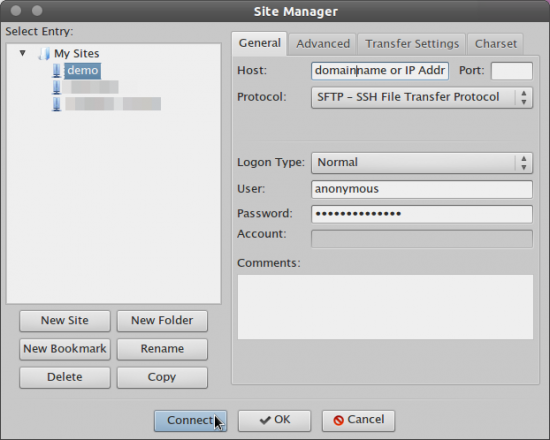 To begin the download process, enter the URL of the file, then locate the folder where you want to save it, specify a file name (although it will be automatically done by the application – so you can leave the field default if you don’t want any specific file name) then There is one great feature – that can be used to execute commands or trigger another application when the download is complete, by default leave to “Do nothing upon completion” if you don’t want to trigger any action on completion. Pausing and Resuming download activities is very simple and there is one tray icon in bottom right corner to control the application. Pinta is a simple and easy to use, beginner friendly image editing/drawing application, very similar to Microsoft Paint program. It is a free software, available for all platforms, the latest stable version is Pinta 1.1 (released few months ago). 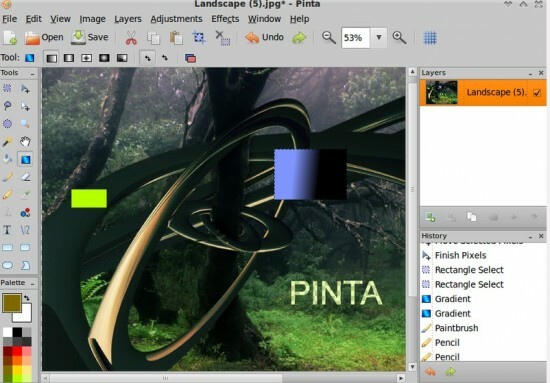 It has lot of cool features like Drawing Tools/Shapes, Customizable workspace, Unlimited layers, Full History etc, Adjustment and cool effects (e.g Artistic Effects for Oil Painting, Pencil Sketch and Ink Sketch), although it doesn’t have all sophisticated features like GIMP and Adobe Photoshop but still worth useful for quick editing, specially for beginners (probably due to its simplicity and ease of use). K3b is a CD/DVD burning application for GNU/Linux based distributions. K3b is a feature rich /sophisticated disc creating application – so you can create different kinds of CD/DVD – very easily using K3b. Pencil is a Cartoon drawing program. It focuses on simplicity but it has a lot of features – that will allow you to create cool cartoons/hand drawings and animations. Pencil is very easy to use and it is available not only for GNU/Linux but also for Windows and Mac. Synapse is a semantic launcher that enables you to launch applications or find files/documents quickly using Zeitgeist Engine (a service that logs user activity and events, so it helps Synapse in searching stuffs semantically). Simply – start the application and kick start the apps or files you are looking for, and – it seems better than Unity’s Lens. If you haven’t tried any quick App launcher yet, then you must give it a try – as it may help you in boosting your overall productivity by cutting down the time you usually spends on searching files or starting applications. Now, just hit Ctrl+Space and Enjoy! (or you can launch (Vow!, that’s a Meta Launch :)) Synapse from Applications -> Accessories -> Synapse). Some plugins are also available – which can even help you in finding and executing terminal commands, take a look at the preferences section for more options. 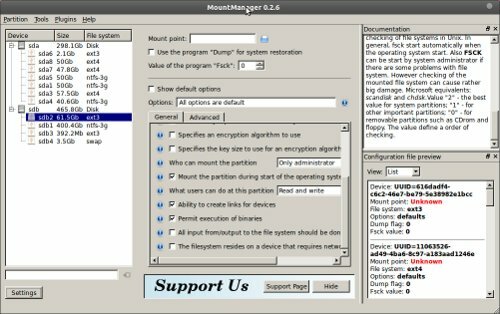 Mount Manager is a simple and easy to use Disk/Partition management software for Ubuntu users. You can Mount/Unmount partitions, edit settings/mount point, change /etc/fstab (which contains FileSystems details and used by many programs including GRUB bootloader, for more info look at man page). It is a robust, stable and easy to use, and of course it is a beginner friendly because on top right you can also read documentation about the options/things you are customizing. Clementine is a sophisticated Music Player and Organizer, inspired from Amarok 1.4. 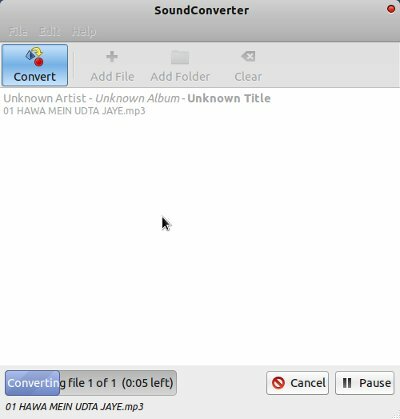 The Application focuses on speed and easy search/play of your music files/albums. It has a lot of cool features including Smart/Dynamic playlists, tabbed playlists with various import/export options, tag editing, visualizations, supports Ogg, mp3, Vorbis, FLAC, AAC etc, queue manager, desktop notifications, go to official site for more details about the features. It is a cross-platform application, in Ubuntu you can find it in Software Center. It integrates seamlessly with Grooveshark, Last.fm, Spotify and others. digiKam is an advanced digital photo management application. it’s a cross platform Application that allows you to manage/organize collections of photo effectively, in a professional way. It is a cross-platform application. It has simple and easy to use interface. 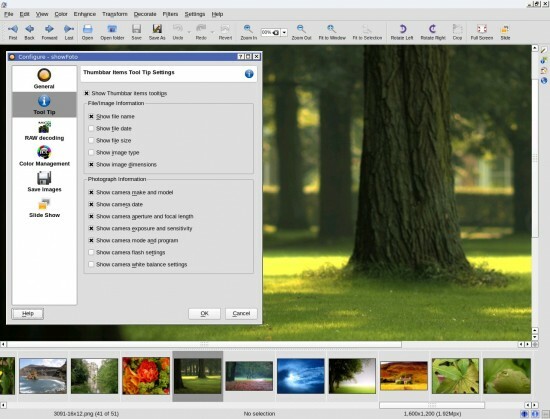 digiKam will allow you to import pictures, organize, view, edit and share it in various ways. Check out the official site for Full List of Features and user guide/manual. 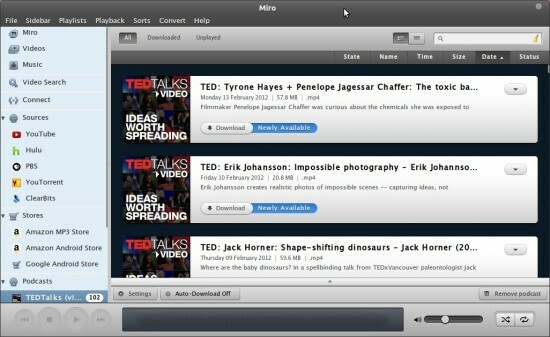 Miro is a Music and Video player, and you can play not only your local music files but also the internet TV, YouTube etc. Besides that, there is also an option to download the file if you want – so basically miro is a great application that will allow you to play all kinds of stuffs – from one place, it’s kind of ‘All in One’ Entertainment box. The user interface looks cool! and the application is available for all platforms.